Well folks, Halloween is over which means that the year is about to seriously snowball. You know what that entails… Yes, I tend to start thinking about holiday shopping quite early, which is pretty essential when you want to get the best deals. One place I know I’ll be ransacking this year for gifts: Ulta. The store never fails to put together some of the best beauty gifts at great prices. Today, I’m rounding up my picks for the best Ulta holiday gifts under $30 that are available now. This would be a fun stocking stuffer for those who love yummy scents and yummy drinks! It includes Ulta’s Moisturizing Body Lotion and Rejuvenating Bath & Shower Gel in either Passionberry Vanilla or Coconut Cream. You get a matching loofah and tumbler for sipping festive frappes! Ulta re-releases the Wink eyeshadow palette yearly, and this time it has a whole new look! With twelve shadows that range from neutral to bold, you are bound to create a ton of different looks with this. I have this in my stash, and will be reviewing it soon! In need of some new travel brushes? Check out this kit from Eco Tools, equipped with three earth-friendly brushes made from bamboo and recycled materials. It includes a fluffy powder brush, a flat eyeshadow brush, and a slanted liner brush. Speaking of brushes, It Cosmetics is expanding their line of Ulta-exclusive brushes with these holiday travel sets. I have a few It Cosmetics brushes myself, and they are amazing to work with. The Your Beautiful Basics travel set includes a powder brush, a shadow brush, and a liner/brow brush. The Your Must Have Airbrush travel set includes a powder brush, shadow brush, and foundation brush. If you’re shopping for a nail art lover, this kit will be a hit! It’s got everything you need to create the most festive, glamorous nails: a nail dotting tool, nail brush, two glitter pots, and a nail jewel/stud wheel. Is it early for holiday shopping? Maybe… But shopping ahead of time can allow you to take advantage of the best deals and full inventory before it gets too crazy. These gifts and more are available on Ulta’s website. Are you shopping for someone really special, and wanna splurge on them? 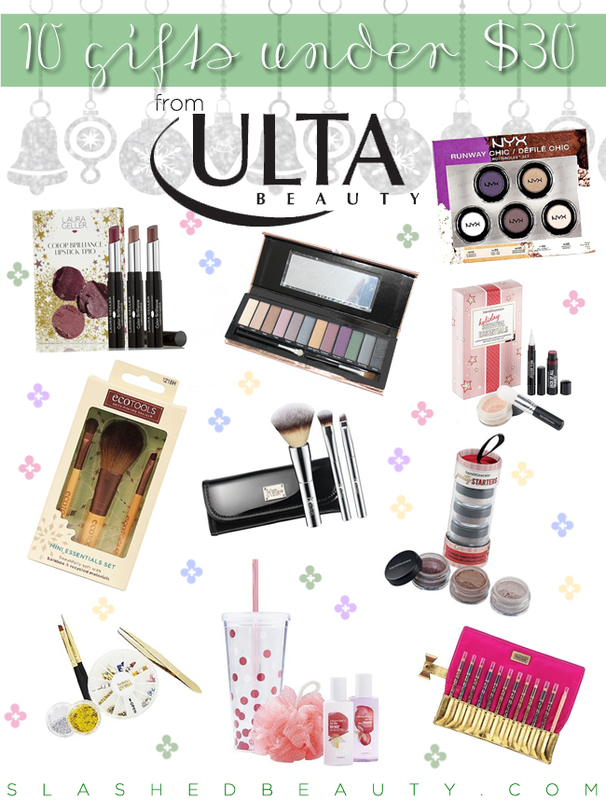 This post was a collab with my friend Katrina from the blog Klassy Kalifornian— she rounded up the best high-end Ulta gifts. Check out her post here. What’s on your holiday wishlist so far? I bought that Bare Minerals trio! They are so pretty but I haven’t used them on my eyes yet! Loving all of these sets! So good! I dropped by Ulta today and was so impressed with their selection. Great picks for the budget-conscious! Eco Tools is a major win and a great gift! The Eco Tools looks fantastic! ohhhhh that Tarte eye liner set! Absolutely picking that up. You picked out a lot of cute gifts! These are all amazing gifts. I like the prices too. I like the NYX shadow set, too. The IT Cosmetics brushes are nice as well. Oooh that NYX shadow gift set looks neat! I have been eyeing that Laura Geller lipstick set…I love all those colors, and the packaging is so pretty! These sets are all amazing! I definitely have a few of them on my wish list!